The family of Samsung sliders have grown incredibly of late. The main development vector consists in making them slimmer with the same elements inside and the same functionality. Moreover, the company has taken a number of measures, in order to ease the pressure of internal competition on the flagship SGH-D600. So the first superslim slider SGH-D800 is equipped with just a 1.3Mp camera and lacks a memory expansion slot. 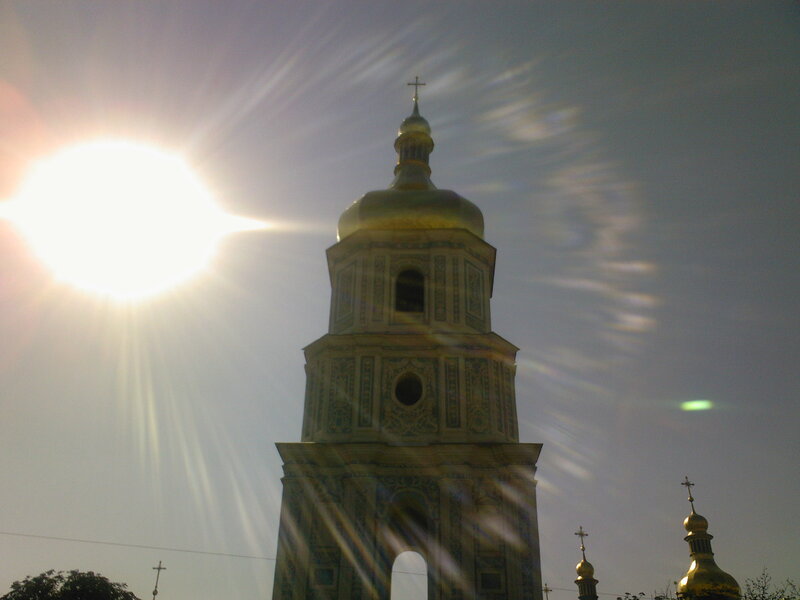 The second model (SGH-D820) retained the slot, but the camera is still 1.3Mp. Only the recent E900 and 840 are equipped with an expansion slot and a 2 Mp camera, like in the D600. But even with this thrifty approach, the old flagship already served its time. Samsung has been preparing a replacement long ago. Generations of multimedia devices from Samsung can be clearly differentiated by camera resolutions. So it's quite obvious that the new flagship will be equipped with at least a 3 Mp camera. Then, Samsung lays the main stress in promoting new models on slim design, practically trying to make all its models superslim devices. Hence, the new flagship is a born Ultra Edition model. We've seen it all in real life. At first this model was named D870. This index tied it down to the previous generation. Then the company took a correct step from the marketing point of view and renamed the new product to D900, a perfect name for its real status. OK, meet the most powerful multimedia GSM phone from Samsung — SGH-D900. 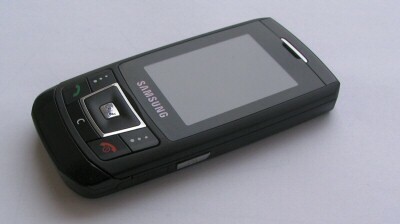 Samsung SGH-D900 is a slider with a thin case, which is made proportionally longer and wider. Such dimensions have been typical of superslim handsets since Motorola RAZR. The D900 design is practically a copy of the D820 and the D840. Angular forms and mat black plastic are the brand features of the Ultra Edition. This style should emphasize the slim case. But it poses a potential threat — a bad choice of plastic or finish makes the device look dull, raises questions concerning its quality, or even affects its ergonomics. We saw these negative effects in the D820, which cheap plastic and mat finish produced an oppressing impression. But the D900 offers an excellent choice of materials. Though not ideal, mechanical properties of the case material are still better than in the D820. There may also be some changes in the case design, because it seems sturdier. When you squeeze the panels, their deformation has no effect on the open/close mechanism. Most surfaces are finished in Soft Touch - mat surface and velvety texture, nice to the touch, which goes well with a glossy front panel. As a result, the D900 looks much more expensive than its predecessor. Design of this slider is quite good. Mechanical rigidity of both halves is sufficient to avoid deformations that would hamper opening the phone. It's easy to open and close the slider, like most models of this design from Samsung. There is a small thumb rest with anti-slip finish under the display. The D900 keypad is typical of Samsung models in the set of keys and of Ultra Edition sliders in design. It's made of a thin plastic sheet, where the keys are outlined by stamped grooves and texture, with contact pads beneath. The sheet is rather soft, the keys are moderately tight, and the tactile feedback is distinct, so the keypad is very convenient. There are no elements between the keys to separate them by touch, so blind typing will not be very confident. You'd better watch what you type. What concerns the geometry, although the keys are not very large, they are spaced out so that it's easy to hit them. Access to the bottom row is hampered by the bulge on the bottom part of the slider. But it's not a big problem. Control buttons on the outer surface of the slider are made as separate plastic components. Their form and size are chosen well. Perhaps they are a bit too easy to press. You may sometimes accidentally press them, when you open the slider. But it won't happen, when you just take the phone out of your pocket or when it's lying there. There are just two buttons at the sides of the base — volume control (on the left) and Photo (on the right). The rocking button is convex, though it does not protrude that much not to spoil the design. But it's enough to easily find it by touch. The Photo button is almost flush with the case, but it's easy to find and press it as well. 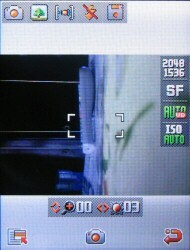 The built-in camera is on the inner side of the slider at the top. When you close the phone, the lens is hidden under the base of the phone, thus protected from dirt and scratches. There is a self-portrait mirror and a LED "flash" next to the lens. There is a combo connector of the new slim form factor on the right side of the base. It allows to plug a charger, a data cable, a stereo headset or a TV-Out cord. Symmetrically, the left side houses the microSD expansion slot (T-Flash). Both connectors are covered with plastic caps on kapron "axes". 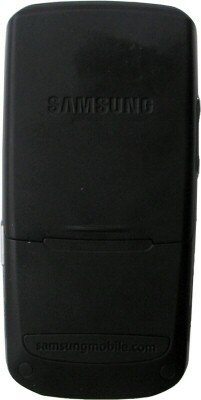 Samsung SGH-D900 is equipped with a QVGA panel, previously used in the D600/800/820. Being relatively small, it still offers the 320x240 resolution and supports 262 thousand colors. The screen produces a very nice impression at first sight — the image is absolutely smooth, pixels are not to be seen with a naked eye. Photographic screensavers look as if printed on a glossy paper. The color balance is precise, the screen offers high brightness and contrast. Like all displays from Samsung, the D900 panel is not transflective, so it fades under direct sunlight. But the absolute brightness level allows to "overcome" the sun problem almost in any weather, except for cloudless. The phone comes with a separate Li-Ion battery. The SIM slot is in the bottom of the battery bay, it has a slit design. There is no spring to push a card out of the slot, as most of the card is open. You can press it with a finger and remove without any problems. The battery bay is covered by a sliding lid with a couple of small latches at the bottom edge. It's very easy to remove/install it, there is no backlash, it does not squeak when squeezed. The phone comes shipped with a good stereo headset, which cannot be disassembled. So you cannot use third-party headsets with this model. The SGH-D900 is based on the latest version of Samsung's software platform. It does not change much so far. The D900 has few changes compared to the D820/E900, consequently even fewer versus the D600 than the D600 had versus the D500. In fact, the main difference consists in moving business applets to another menu. Even the menu design in the D900 is exactly like in the E900. In addition to the inverse variant, there is a white background option. 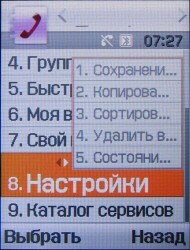 There are several options of the dial screen. There appeared a new design, when the background imitates old paper and variegated numbers are typed with a virtual pen in cursive font. The main menu is a two-dimensional matrix of 3x3 icons, navigated through with the joystick. Horizontal scrolling is line-cyclic (the next/previous line appears when you reach the last option in a row), vertical scrolling is rotary. You can use shortcuts, especially as the layout of icons corresponds to the keypad layout. The second level of the menus is textual unidimensional. You can navigate it by moving the joystick vertically. But in most cases you have an additional option — you can jump to neighboring options of a higher level by moving the joystick horizontally. The E900 has a new feature — popup context menus, which options are taken from the highlighted menu. You can choose them by pressing the joystick to the right. It makes the navigation much more complex. The context menu blocks the screen - it covers neighboring options, "disables" joystick-to-the-right, which should have taken a user to the next option of the higher-level menu, following the logic of the menu. And most unpleasantly, this feature cannot be disabled - we haven't found an option to do that. That's a pity. As the menu and functions of the D900 and the E900 are identical, the next part of the review up to the Camera chapter copies the E900 review, for the exception of different order of menu items. The phone is equipped with an advanced address book that can store up to 1000 entries. Each of them contains a name and surname of a person, which are stored in separate fields — Name and Last Name. You can enter three phone numbers (mobile, home, work), fax, another number (Etc), e-mail, individual ringtone, picture to be displayed when this contact calls you, group, and note (you can type a postal address here). Entries from memory and SIM card are displayed in a single list. There are also several nice features, such as the default action when you save a new contact. 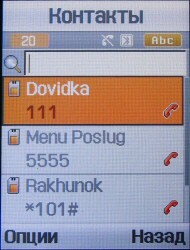 The list of contacts displays not only names, but also default numbers. Entries in the address book can be sorted by the name or the last name, you can choose it in the Phonebook-> Settings menu. 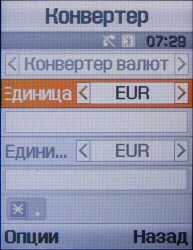 The context menu of a contact allows to call a selected number, send SMS or MMS, as well as to send the contact via Bluetooth or as part of SMS, MMS or e-mail. Call log is not changed — it contains a list of calls grouped by the type. Phonebook menu allows to browse a list of contacts, perform some operations, as well as manage the address book. It contains settings for group properties, shortcuts, business card of the owner, etc. 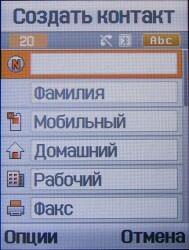 Applications menu contains business and entertainment utilities. 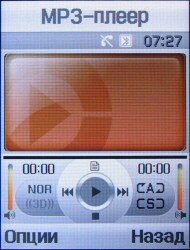 MP3 player — software player of music files in MP3 format. The phone allows to play music in MP3 and MP3Pro format with fixed (up to 320 kbps) and variable bitrate. You can compile a playlist from the files in memory with a custom playback order. All in all, the phone has four preinstalled playlists to be filled with your music. That is the phone supports the concept of semi-free playlist management. The music can be played back through the phone speakers as well as through the stereo headset. The newest option, that appeared in the previous generation of Samsung phones (E900, D520, D820) is support for Bluetooth headsets. You can choose to output audio to such a headset right in the player. 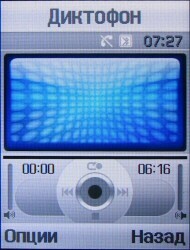 Voice recorder allows to record audio fragments of selected length (1 hour maximum) or send them via MMS (limited file size). You can stop recording any time, so the optimal setting is one hour. Unfortunately, the voice recorder cannot be used professionally. The one hour limit does not allow to record lectures, long interviews, etc. The voice recorder does not work during a phone call. Photo editor allows to perform simple operations with images — apply preprogrammed effects, frames, geometric transforms, color correction, brightness and contrast changes. These functions will help you correct a photo, if the phone is equipped with a good display. These functions are optimal for such a device: it has no drawing functions, which are so difficult to use because of limited controls and display, but automatic filters are very easy to use and their results are well discernable on the screen. Bluetooth. This interface can be used not only to connect the phone to a PC or a wireless hands-free. It can be used to transfer files between the D900 and any other devices supporting OBEX. 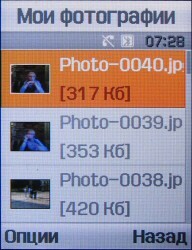 When a connection is established, the phone can browse shared folders on a target device and load files of supported formats. You can use the Send -> via Bluetooth option to transfer files. This option appears in a context menu, when you browse files in a photo, video or audio browser of the phone. Java world gives you access to Java applets in your phone. There are three preinstalled games there — Forgotten Warrior, ArchAngel, and Freekick. All the three games are well-known from our previous reviews of Samsung models. The Messages menu contains commands to manage messages and their parameters. 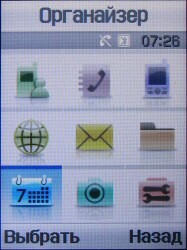 The phone supports SMS, MMS, and e-mail. My files menu allows to browse photos, videos, MP3 files, ring tones. It also contains an applet to get memory status. You can open a selected file with a corresponding program, which is started automatically. Planner gives you access to an organizer. It has migrated from the D600 to the D900 practically unchanged. 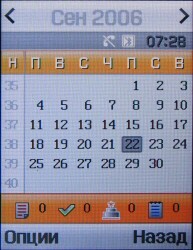 The calendar offers month, week, and day modes. A total number of reminders is 400, there are four kinds of them (Appointment, Anniversary, Task and Miscellany). The same menu also contains business utilities, which used to be available from the Applications menu. 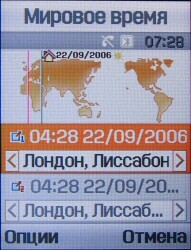 World clock traditionally shows a map of destinations to choose from and offers usual functionality. Alarm allows to schedule three signals. Each of them can be single or recurring (daily or on selected week days). 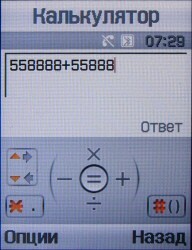 Calculator — a traditional program from Samsung. It's simple, but it allows to perform arithmetic functions in brackets. The interface has been changed again. Converter allows to convert currency, length, weight, volume, area, and temperature units. Applet features are the same. 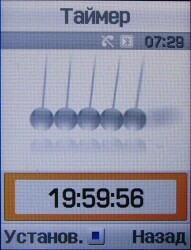 Timer — a simple applet to count the time down. 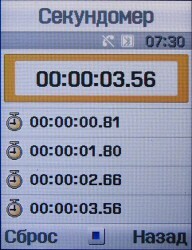 Stopwatch is also very easy to use. You can store up to four intervals. And finally, the Settings menu allows to set date and time, configure the phone, display, alarms, network services, and data transmission. Let's give a recap of the most interesting options in this menu. USB Settings. You can select a USB mode to be used when you connect your phone via USB — Modem (in this case you phone works as a GPRS modem), Mass Storage (the phone works as a USB Mass Storage, to be more exact as a card reader, as you get access only to an expansion card), and Pictbridge (Windows detects the phone as a camera/scanner; images from the phone are downloaded via WIA service). The last option may come in handy to print photos directly from the phone. Offline mode. Phone functions requiring network connections are deactivated. It's very useful, if you want to use your phone in a plane as a player or camera. Light settings. You can adjust brightness of the display, but the range is not very wide. It's useful to run Java applets for reading ebooks or to save the battery, if the phone is not used under bright sunlight. TV Out. You can choose a standard of the output signal — PAL or NTSC. Key Management. The phone supports DRM for playing files that require a license key. Samsung SGH-D900 is equipped with a 3 Mp camera, that's the first GSM phone from Samsung with this camera resolution. The camera uses a CMOS sensor, there is no flashbulb, just a LED to flash when you shoot. But it gives little light. The D900 lens is equipped with an auto focus system. The Photo button has only two positions, it does not detect half-presses, so forcing autofocus manually is out of the question. You just point the device and press the button (Photo or OK). The phone starts an automatic sequence - focusing, exposure metering, and taking a photo. A drawback of this system is evident - when the auto focus system fails, there is no way to refocus fast. You have to wait an entire capture-store cycle before the next focus stage. And the scene you want a picture of can change for that time. Besides, you have to allow a lead for the first stages of the cycle. That is, you will never capture what you see as you press the button in case of moving targets. The camera supports the following resolutions: 2048x1536, 1600x1200, 1280x1024, 1024x768, 800x600, 640x480, 320x240 (album or landscape) or 240x180. Camera options include multi shot (6, 9, or 15 photos at normal or accelerated shooting speed), mosaic shot - lots of layouts, color effects, and artistic filters (color, monochrome, negative, sepia, relief, sketch, moonlight and fog imitations), automatic frames, timers - 3, 5 or 10 seconds. There are also some advanced settings — quality level (3 grades), auto focus on/off, night shot mode (increased exposure), exposure metering (center-weighted, spot or matrix), white balance (auto plus 5 scene programs), ISO (auto, ISO 100, 200, 400). So, the D900 camera offers rich functions and flexible control, typical of all top models from Samsung. However, these functions are usually rarely used. The most popular mode is fully automatic. The quality of photos, taken by the D900, is a tad worse than we expected. There are three major flaws — faded colors, typical of mediocre CMOS sensors, blurry focus, and slow reaction. Photos are in pastel shades even in ideal lighting conditions. Besides, the camera may set the wrong white balance, typical of all Samsung models since the D600. As a rule, the colors are too warm. 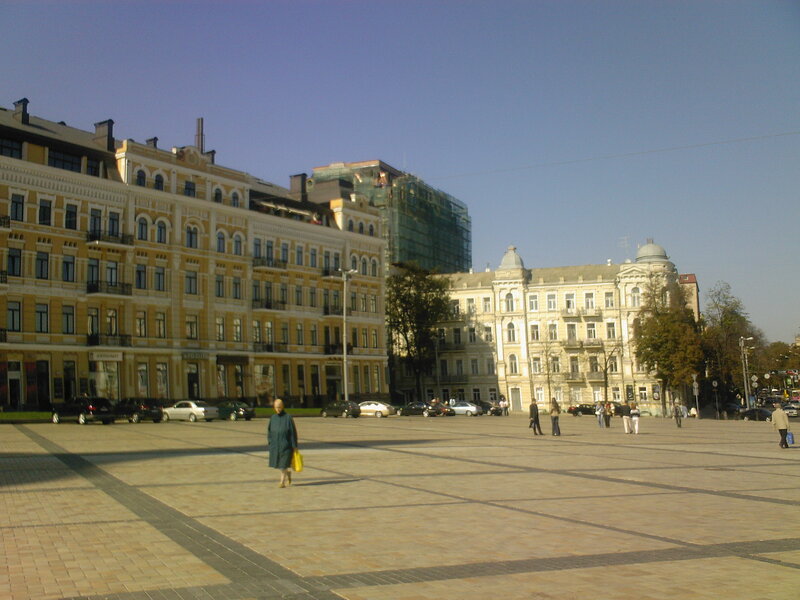 Together with insufficient saturation, it produces a well-recognizable effect of a CMOS photo. But the colors may also shift to the blue hue. It's very difficult to get a sharp photo. It may be the fault of the auto focus system that is not accurate enough or a too long exposure, when such problems appear because of shaking hands. The D900 has no special macro mode, like practically all phones with autofocus cameras. But it focuses well at 3-5 cm. Sharpness is not ideal, though. The phone can record video in the following resolutions: CIF (352x288), QVGA (320x240), QCIF (176x144), or 128x96. The record quality is not bad. 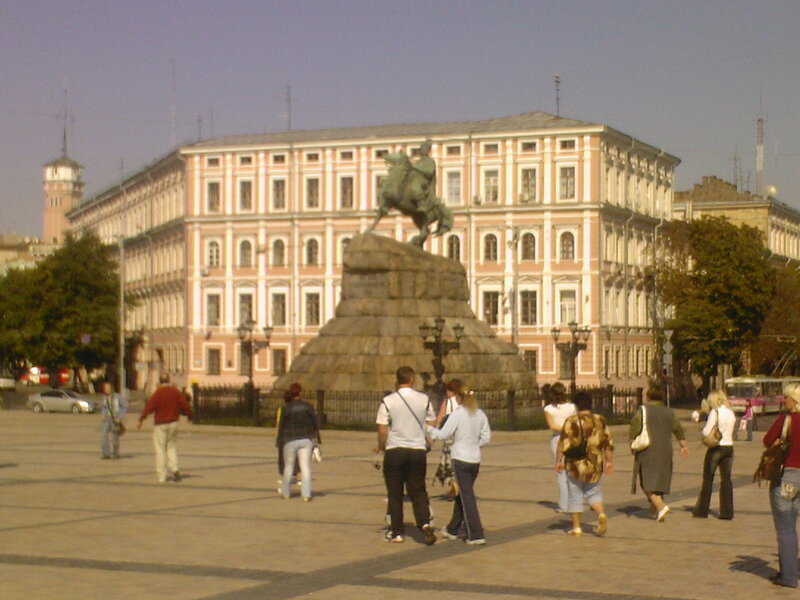 PicselViewer. This suite allows to browse files in MS Office and other PC formats. Applets from this suite work with XLS, WMF, TXT, PPT, PNG, PDF, JPG, GIF, DOC, BMP, and AGIF. These programs cannot be started as stand-alone applications from the menu, they are started automatically when you open a file of the respective format in a file browser. TV Out. This function has been used since the D600 - you can view the display of your phone on a screen by connecting the phone and TV with a TV out cable. It can be the phone desktop, photos, or videos. Living World. A new option in the D900 interface. Desktop wallpaper and some icons change depending on various parameters — geographic location, time, reception quality. The desktop shows a photo of the main sight of the country you are in. When it gets dark, the day photo changes to the night one, and the sky indicates the reception quality. Some events (incoming messages, alarms, etc) add other elements to the picture. You don't notice this feature right away, but it becomes intuitive and very convenient in time. Samsung SGH-D900 uses a typical Samsung radio module, so it has no specific problems with network connection. Battery life, audio quality, polyphony and vibra are similar to other ultraslim models from this company, that is they are on a good level. Samsung SGH-D900 is a high-quality interesting model from the technical point of view, but it has some serious drawbacks. Here are advantages of all ultraslim Samsung models: excellent display, convenient controls, a full set of consumer (that is "noticeable" to common people) functions, support for Bluetooth A2DP. There is also a useful innovation - the offline mode to use the player and camera in a plane. The case is made of high-quality plastic with good finishing. The major drawback of this model is the camera of mediocre quality. 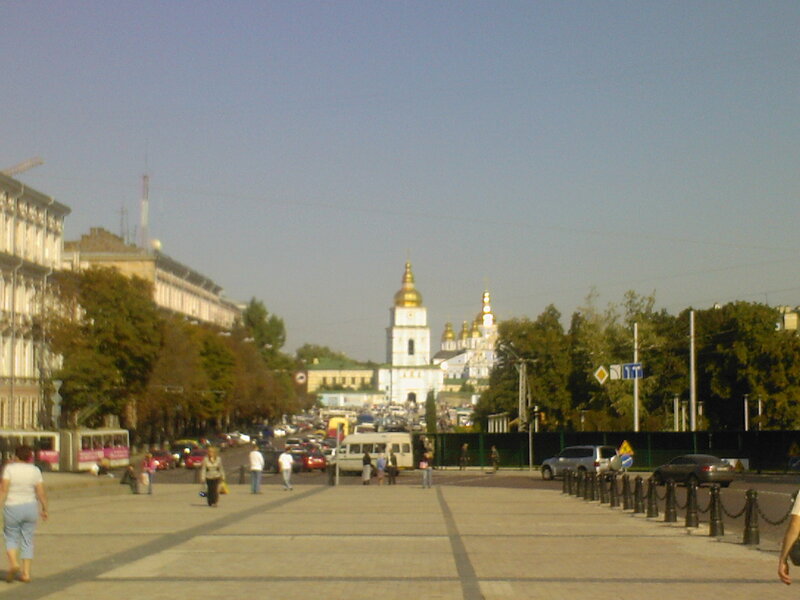 With the increased resolution and nearly professional options, its photo quality is not stable. Our main gripes have to do with focus errors (blurry images) and frequently wrong white balance. To all appearances, the first problem has been brought by the auto focus system. So there is hope for it to be fixed in one of the production-line series. 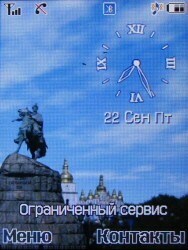 The second problem is typical of 2 Mp and higher built-in cameras from Samsung. It hasn't been fixed for a long time. Of course, the problem can be fixed by choosing a proper option manually. But in practice, the most important mode (and for majority users — the only mode they use) is fully automatic, point-and shoot style. The D900 works noticeably worse in this mode than Sony Ericsson K800i or 5 Mp LG KG920. The camera is also noticeably slower than the 2Mp camera from the D600 and the like. But thank God, it's far from 10-15 second delays in the KG920. Note that Samsung's platform has been developing very slowly since the D500. There are practically no major differences in business functions, multimedia features are also fixed. Samsung follows the way of researching and introducing new functions, required by a little group of users. It discovered interesting features — TV Out, Picsel Viewer, motion sensor, Living World. But it's the platform core development that can make a model much more attractive. And we don't see it here. What's our evaluation of the D900 and to whom can we recommend it? Despite the above-mentioned drawbacks, it's an excellent stylish handset. That's exactly how you should take it. That's the best superslim slider, which is superior to the MOTORIZR yet to come. The Korean company manufactures an entire series of models that look very much alike (D820/D840/D900). This fact grades the product under review down - you are tempted to buy one of the cheaper models and get practically the same features. But if you want a fashion model with the 3 Mp label near the camera lens, the D900 won't disappoint you — it has no annoying drawbacks in exterior and functions. But serious photographers, who plan on actively using a camera and have strict requirements to its quality, shouldn't consider this model so far — they had better choose Sony Ericsson K790i/K800i.